The Torah Portion for this next Sabbath is named Terumah (which means contribution or donation) from Exodus 25:1 – 27:19. The reading from the prophets is from 1 Kings 4:26 – 6:13, and from the Gospel we will read Mark 12:35-44. This is the Creator of the Universe speaking to the children of Israel, who had left Egypt and were delivered from slavery just two months prior. They have not tilled a field, or planted a tree, or built a house. They have crossed the Red Sea on dry land without lifting a finger for themselves. They have managed to murmur and complain and accuse Moses and God for taking them out of Egypt, and have wanted to return to Egypt. Suddenly the Lord commands Moses to tell the children of Israel to bring Him an offering. This time it is not an “offering” of an animal on the altar. This time the kind of offering that the children of Israel need to bring to the Lord is specified in verse 3: gold, silver, bronze, purple cloth, scarlet thread, fine linen, goats’ hair, ram skins dyed red, badger skins, acacia wood, oil for light, spices for the anointing oil, precious stones for Aaron’s breastplate and the like, etc. This is not the tithing that was for the Levites and the priests, this is a special contribution for the building of the Tabernacle in the wilderness. This is a beginning of something totally new in the history of the Israelite faith. Abraham, Isaac, and Jacob, the fathers of our faith, did not have a holy place nor did they have a “temple” of any kind. They worshiped God anywhere and everywhere. They built altars and made offerings of animals anytime and in every place. There was no religious “establishment” to administer their relationship with the Almighty. The only people who had temples to their gods were the idol-worshiping nations. The children of Israel had just come out of Egypt. Egypt was full of the most magnificent temples to their gods. There were many gods in Egypt, and each one of their gods had his private temples and worship. Some of these temples, even some with traces from the time of Moses, are still standing and still magnificent. Now, in the wilderness of Sinai, all of Israel is living in tents, they move according to the signal of the Lord – by day a cloud and by night a fire. There is nothing set in stone other than the Ten Commandments. Everything is makeshift and temporary. And now a command comes from the LORD God of Israel to Moses : ask the people to bring an offering, a contribution of these precious materials, so that I can have a place inside of them – in their midst. The Hebrew is hard to translate properly. A literal translation would be, “make Me a temple and I will dwell inside of them.” The Christian translators could not get the point. They were used to church buildings, and temples, and cathedrals – the house of God was the building itself. In the second part of this verse, Paul is fusing two texts: Leviticus 26:12 and Ezekiel 37:27 (the text from the vision of the valley of dry bones that come to life). The LORD’s intention was never to have a temple made with human hands. The Tabernacle that Moses and Aaron built was patterned after a heavenly Tabernacle that Moses saw when he was atop Mt. Sinai talking to the Lord for 40 days and nights. Indeed, dear brothers and sisters, if we would learn from the Torah and from the Old Testament, I believe that we would have a much more biblical attitude towards the church buildings, and become more useful to our communities with the wealth and facilities that the Lord has given us. This of course is true for our relatively new building in Jerusalem. We have learned our lesson, and now there is activity here every day: feeding the hungry and poor of Jerusalem, radio and video teachings, and publishing printed material that go around the world, and youth activities, women’s activities, community activities, and on and on! Not that others don’t do the same. But even in the USA, most church buildings are used very sparingly. When I travel in the USA and pass some church buildings, most of the days of the week they are empty and locked up. At least Catholic churches are open most of the time, and there is at least some person inside to hear you and to talk to you! In our congregation in Jerusalem, this Torah portion is the only time of the year that we talk about giving. In fact, this is what happens in most of the Jewish Synagogues around the world. This topic is powerful and challenging, and therefore one time per year is enough to make just the right impression to those people who have a heart for the Lord, and His Kingdom and Kingship over their lives. As Paul and Moses said, the giving to the Lord has to come from our hearts. If it doesn’t, it is worthless for us in this life and especially in the life to come! Growing up in Israel, one of the things I remember from bible class during primary school is the teacher explaining that the Bible is a very condensed book and if it ever repeats something that is a clue to us to the significance of that matter. The portion this week, Parashat Terumah (contribution) focuses in great detail on the materials that the people of Israel donated in order to build the Lord’s earthly dwelling place and the artifacts used in the service of the Lord and his dwellings such as the ark, the table, the altar, and the menorah. The list of acceptable items is long but particular, certain colors, certain animal skins, specific metals and gems and so forth. Usually, contributions are given not demanded, how then do we explain the matter? One thought is that by giving a donation they are“taking” an eternal reward. Another idea is that by contributing to the dwelling place of the lord they are in a sense investing a part of themselves in it, creating a partnership with God, “gaining ownership” of it, like children building a treehouse feel strong feelings of possession and ownership, more so then if someone buys it for them. Then comes over two chapters of precise instructions on each of the artifacts, the measurements the materials and so forth, it reads like a cross between a Lego manual and an IKEA instruction pamphlet. If we go back 30 years to my primary education Bible classes we see that the author of Exodus deems it extremely important to convey to us this information, or else the bible which is so condensed wouldn’t “waste” two chapters on this and later in the Bible in 1 Kings chapters 5-7 we once again have three chapters describing King Solomon building the temple. We read in Acts, Hosea, Matthew and other places some more interesting things about the temple and the offerings. If our bodies are the temple that would explain why the bible which clarifies to us that God doesn’t need an earthly dwelling still spends so much time going into detail because it is important! Because us giving our lives to God, living to glorify His name, living holy lives dedicated to observing His commandments. As disciples of Yeshua part of our walk with the Lord is to spend time with Him, spend time studying His word in an attempt to understand His will for us. If the Bible goes into such detail about the construction of the Temple, yet tells us that the earthly temple is not important to God, and then goes on to tell us that we are the Lord’s temple, the lesson is that we must be just as meticulous and intentional about preparing ourselves to be the house of God, if it’s spiritual such as to be holy, be dedicated, study the word, or physical, such as try to live healthy and not harm ourselves. After all… our bodies are His temple. As they have purposed in their hearts, i.e. as they have decided before hand with sincerity of heart. Generously, because it is like a seed that is sown in the ground and the harvest is dependent on the amount of seed sown. The translation in English reads “among them.” However, when seeing the words of King Solomon and the following texts we understand that the real purpose of the Lord was to dwell in the people. Let’s go back to the building of the Tabernacle. There were a number of reasons for the construction of the Tabernacle. One of them was to unite the people in a common project, a national project. We have to remember that Pharaoh’s intention was to break the spirit of the people. Now we have to rebuild the spirit of the people, to build mutual responsibility and cooperation, ending with something that is not only beautiful and glorious, but also has profound spiritual significance. Indeed, the building of the Tabernacle required the cooperation of the entire nation, everyone was invited to participate in any way, be it with assets or with skills. And even if you had none of those things, you were invited to go to Bezalel and learn a craft, for he was the one who had “the ability to teach others” (Exodus 35:34). It was a privilege, not an obligation, to contribute. The entire nation responded. And the excitement, the activity, and the generosity accompanied the project until its successful completion. As we mentioned in the beginning, the people gave so much and did so much work that Moses had to issue an order to stop the contributions and the labor, because the people gave and did too much (Exodus 36:5-7). A forest is really just a tree and another tree and another tree, and humanity is a person and another person and another person. And our Father in Heaven cares for and counts the smallest details, like the hairs of our heads. And no one is marginal or unimportant, the Jewish Sages rightly say that every person is an entire world. The origin of the concept of the image of God is found in the Book of Genesis, it is described to us that man was created in the image and likeness of God. From here comes the concept of sanctifying life and the severe prohibition on shedding blood, for killing a person cancels out a life of divine meaning. From this we also get the ideas of equality, liberty, and brotherhood amongst men. For all are created in the image of God. The Jewish Sages expressed this by saying that no one’s blood is redder than that of another, therefore it is not fitting for a person, as great as he may be, to cancel the existence of another for his own existence, or to rule over him. Rather, we are to treat one another with love, as a brotherhood. According to this perception, when one harms the other, physically or mentally, he does harm to the image of God. And those who despise a person, actually despise God reflected in them. The word “Terumah”, which is the title for our parasha, is Hebrew for “contribution”. Contribution is a great and important thing, because it brings a sense of belonging. It opens the heart and enhances emotion. Let’s put aside, for a moment, the idea in our minds of a magnificent tabernacle in the heart of the desert. Let’s look at how the Tabernacle project is described in Scripture. It’s a poor people’s project. It’s a shaky desert hut – made of a patchwork of materials and products. But all of it together forms one large collective heart. The message of the meticulous detailing of the contributions is that the simplicity of the materials is actually the greatness of the Tabernacle. 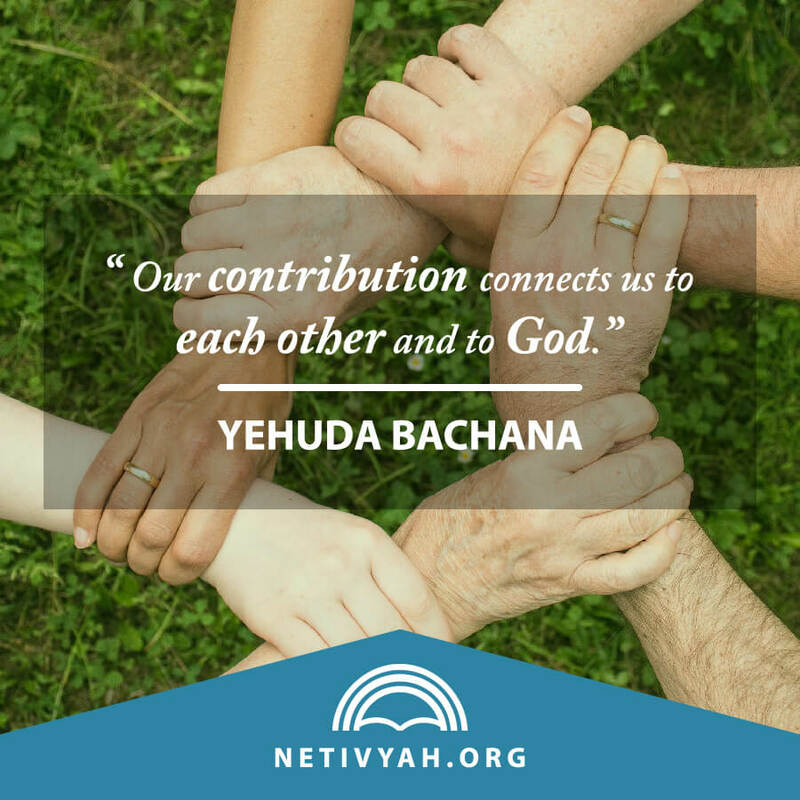 Our contribution connects us to each other and to God, and giving with all of our heart entitles us to the presence of God among us. Shabbat Shalom.